Eight University Technical Colleges (UTCs) have been listed among England’s worst providers for overall absence. The Department for Education statistics, for last autumn, show how Elutec, in Essex, is the worst of the UTCs with a figure that put it at eighth in the list of shame among providers which recruit pupils aged five to 15. Its 14.5 per cent is based on the total number of days missed as a proportion of the total number of days it was possible for pupils to attend during the term. The figures come just days after the doomed Black Country UTC was hit with an Ofsted inadequate result with a report that outlined poor attendance and behaviour, as reported on feweek.co.uk. 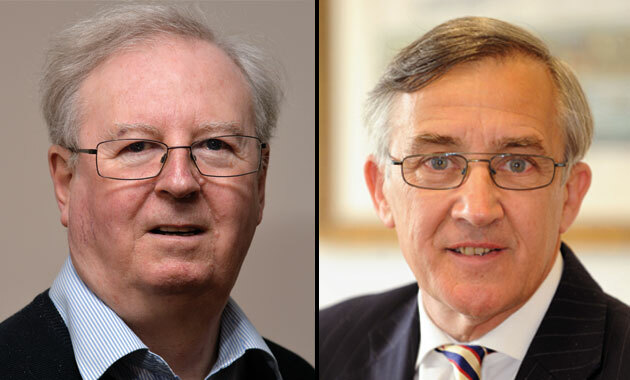 However, Professor John Howson (pictured above left), managing director of DataforEducation.info and a fellow of the University of Oxford, said the figures raised questions about the UTC intake. It is not the first problem revealed to have been affecting UTCs specifically, and comes after FE Week revealed in April that six of the existing 30 UTCs were operating at up to just 33.3 per cent of their capacities. Two UTCs — Hackney and Black Country — are due to close at the end of this year, but this did not stop the Conservatives launching their manifesto at Swindon UTC in April. Nor did it stop Prime Minster David Cameron singing their praises in front of a packed House of Commons on Wednesday (May 27). During a Parliamentary debate following the Queen’s Speech, Mr Cameron was pushed by Aldershot MP Sir Gerald Howarth (pictured above right) to praise Lord Baker, the former education secretary who is a key proponent of UTCs. Sir Gerald said: “Will my right honourable friend also pay tribute to our noble friend Lord Baker, the former secretary of state for education, who has launched a fantastic campaign to promote UTCs? Mr Cameron replied: “My honourable friend is absolutely right. I pay tribute to Lord Baker of Dorking. He was a huge enthusiast for education reform when he was secretary of state, and he has kept that going all his life.